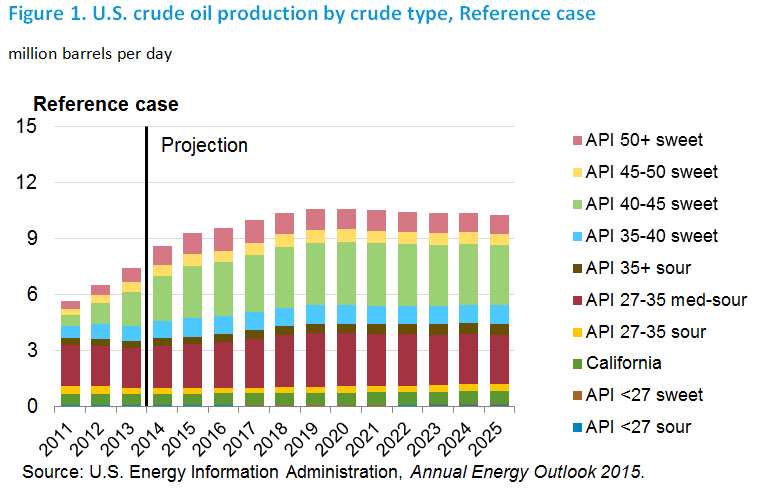 EIA's latest Short-Term Energy Outlook, issued in May 2015, reflects continued production growth in 2015 and 2016, albeit at a slower pace than in 2013 and 2014, with U.S. crude oil production in 2016 forecast to reach 9.2 million bbl/d. Beyond 2016, the Annual Energy Outlook 2015 (AEO2015) projects further production growth, although its pace and duration remains highly uncertain. Recent increases in domestic crude oil production and the prospect of continued supply growth have sparked discussion on the topic of how rising crude volumes might be absorbed. As EIA noted nearly two years ago, relaxation of restrictions on U.S. exports of crude oil is only one among several ways to accommodate growing near-term flows of domestic production (EIA, This Week in Petroleum, "Absorbing increases in U.S. crude oil production," May 1, 2013). Recognizing that some options, such as like-for-like replacement of import streams, are inherently limited, the question of how a relaxation in current limitations on crude exports might affect domestic and international markets for both crude oil and products continues to hold great interest for policymakers, industry, and the public. In response to multiple requests, EIA is developing analyses that shed light on this question, including earlier reports on gasoline price determinants (EIA, What drives gasoline prices?, October 2014), changes in U.S. crude oil imports to accommodate increased domestic production (This Week in Petroleum, "Crude oil imports continue to decline," January 23, 2014), options for refinery capacity expansion (EIA, Technical Options for Processing Additional Light Tight Oil Volumes within the United States, March 2015), and refinery responses to higher, but fixed, levels of domestic crude oil production under both current crude oil export restrictions and with unrestricted crude oil exports (Implications of higher domestic crude oil production for U.S. refining, May 2015).